The 2017 Ram 1500 is a light-duty pickup truck that provides durable exterior engineering, sophisticated interior design, many modern features, and a large variety of slick storage capabilities that help to make economical use of the cabin space to optimize the available room. 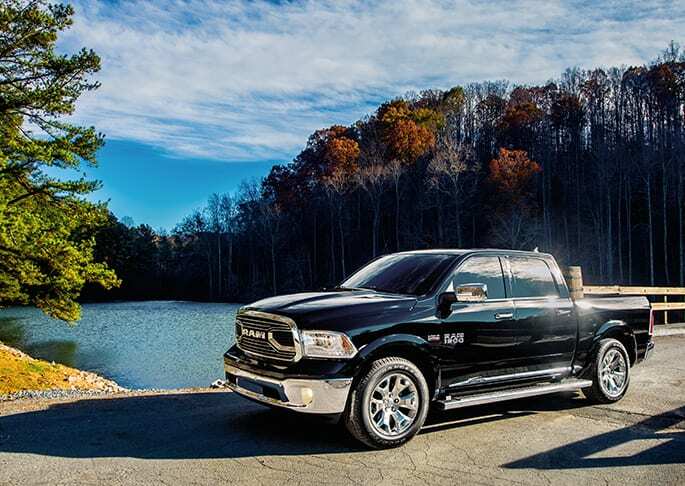 The Ram 1500 comes in ten different trim levels each with different permutations of the available equipment to emphasize different functions and characteristics of the vehicle. 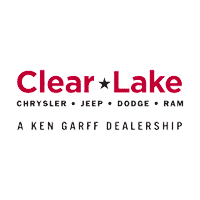 The trim levels include: Tradesman, Express, HFE, SLT, Big Horn/Lone Star, Sport, Rebel, Laramie, Laramie Longhorn and Limited. The 2017 Ram 1500 boasts three different engine options. The first is the 3.6-liter V6 engine which can produce up to 305 horsepower and 269 pound-feet of torque. For greater power, some trim levels come standard with a 5.7-liter V8 which generates 395 horsepower and 410 pound-feet of torque. Those seeking improved fuel economy should consider the turbocharged 3.0-liter ecodiesel V6 engine which generates 240 horsepower and 420 pound-feet of torque. Rear-wheel drive is standard on the 1500 but there are two four-wheel drive options available to be paired with the engines. There are multiple body styles available for the Ram 1500: a Regular Cab which seats three, a Quad Cab which seats six, and a Crew Cab which also seats six but features larger rear doors and more rear legroom. All 2017 Ram 1500 models come standard with an eight-speed automatic transmission. Pairing a sturdy exterior with a classy interior, the Ram 1500 has a fine, sophisticated sense of style at all trim levels. Some trim levels even feature premium materials such as a wood-accented steering wheel, upgraded leather upholstery, and wood interior trim. 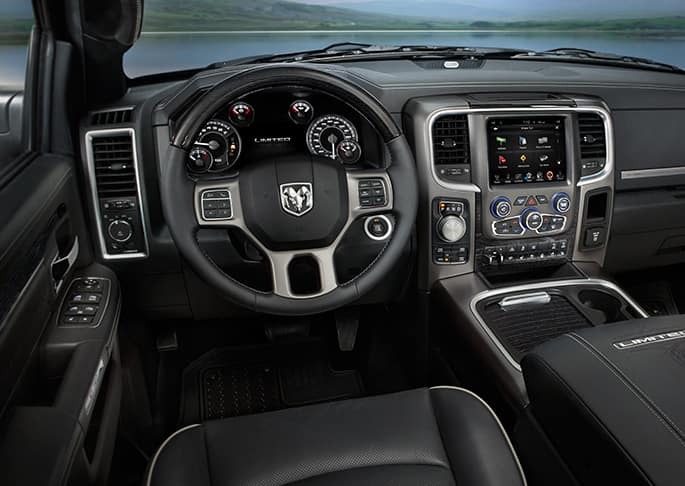 The Ram 1500 provides a choice of infotainment controls including a 5-inch Uconnect touchscreen display option and an 8.4-inch Uconnect touchscreen display option with physical buttons as well for occasions when the touchscreen is less suited. There are a number of updated conveniences available in the 1500’s interior to make the ride comfortable and its functions accessible. Power-adjustable pedals help to optimize the driver’s position, while voice controls and smartphone integration give the driver convenient access to a wide variety of functions. Wi-Fi hot spot capabilities help to keep the driver connected while remote start and keyless entry and ignition, give the driver access to their vehicle long distance. 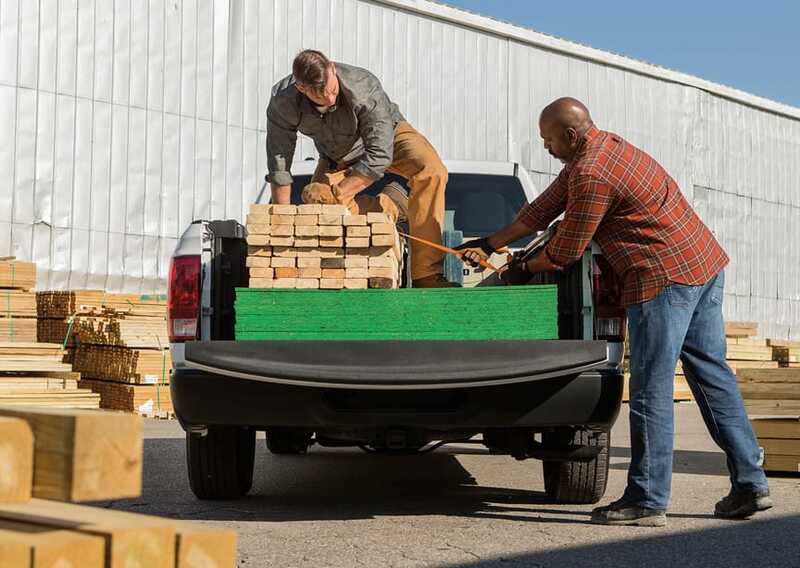 The Ram 1500 offers a number of optional and standard storage options that make economical use of the space. The crew cab option has a watertight storage compartment in the rear floor and bins beneath the rear seat. RamBox is another storage option that features a lockable compartment in the truck-bed which, when properly equipped, can be locked and unlocked remotely. There are many standard and available features on the 2017 Ram 1500. Trailer-sway control, antilock disc brakes, stability control, full-length side curtain and front-seat side airbags, and hill start assist all come standard. Front and rear parking sensors, a rearview camera and a fully integrated trailer-brake controller are all optional. If the model has Uconnect Access, an emergency telematics system is also available which is able to contact emergency services. With a variety of neat storage capabilities and unique features mixed with powerful engine options and exterior utilities, the 2017 Ram 1500 is a unique choice of vehicle.